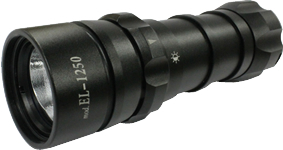 1250 Lumen LED spot and wide by one unit!!! High power 1,250 lumen!!! CREE XM-L T6x2 bulb! It can be used for underwater video using with clog-adapter. It can be done easily screw in the light head thread. It can make a creative world as you like.